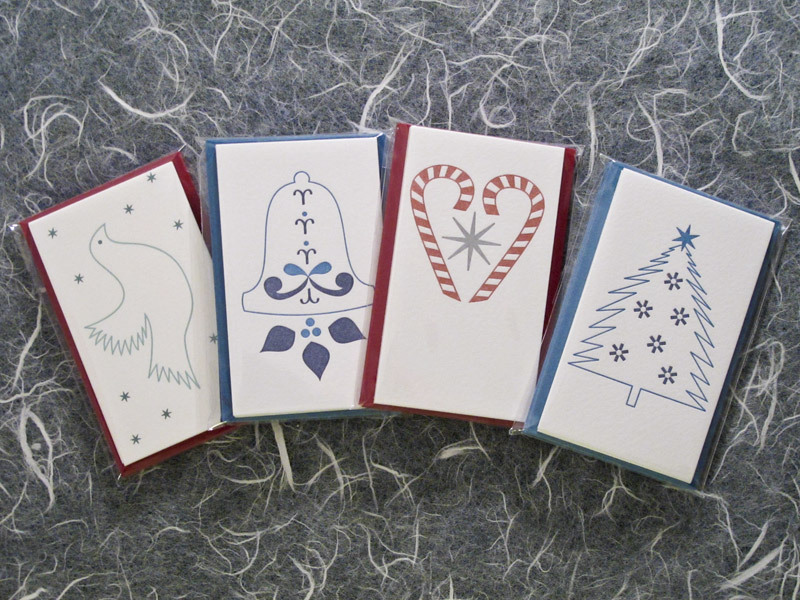 Boston Handmade: New Holiday Card Line! I'm so pleased with how my new holiday card line turned out! Building on the momentum of the holiday card I designed last year, I developed two new complimentary holiday cards for the 2011 season along with matching gift cards. The illustrations in these holiday cards combines common motifs and shapes found in wycinanki with iconic holiday images such as candy canes, trees, bells, and a dove. The cards are letterpress printed in two colors on on 100% cotton paper on an antique Vandercook press and come with complimentary envelopes (the gift cards too!). The larger cards are A2 and the small gift cards are business card size. You can find these cards at the Boston Handmade Downtown Gallery, Craftland in Providence, RI, as well as upcoming events including the SOWA Holiday Market. These look beautiful! Great photos too. Awesome.